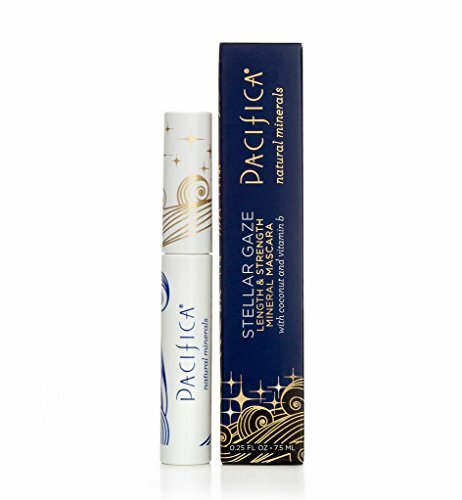 Why we love it: Get bigger, bolder lashes with the Stellar Gaze Mascara from Pacifica. Formulated with ultra-nourishing coconut oil and hydrating vitamin B, this mascara keeps lashes healthy and happy while making them look longer and volumized. Apply 1-2 coats to top and bottom lashes. Available in 2 colors. AQUA, GLYCERIN (VEGETABLE), GLYCERYL STEARATE SE, JOJOBA ESTERS, TAPIOCA STARCH, STEARIC ACID ( VEGETABLE), COPERNICIA CERFERA (CARNAUBA) WAX, EUPHORBIA CERIFERA (CANDELILLA) WAX, ARABIC/ACACIA GUM, ACRYLATES, CROSSPOLYMER, POTASSIUM CETYL PHOSPHATE, MICROCRYSTALLINE CELLULSE (PLANT), COCOS NUCIFERA (COCONUT) OIL, PANTHENOL (VITAMIN B), CELLULOSE GUM, GLUCONOLACTONE, MACROCYSTIS PYIFERA (BROWN KELP) EXTRACT, HYDROLYZED ORYZA SATIVA (RICE) PROTEIN, SODIUM BENZOATE, IRON OXIDES C1 77499.